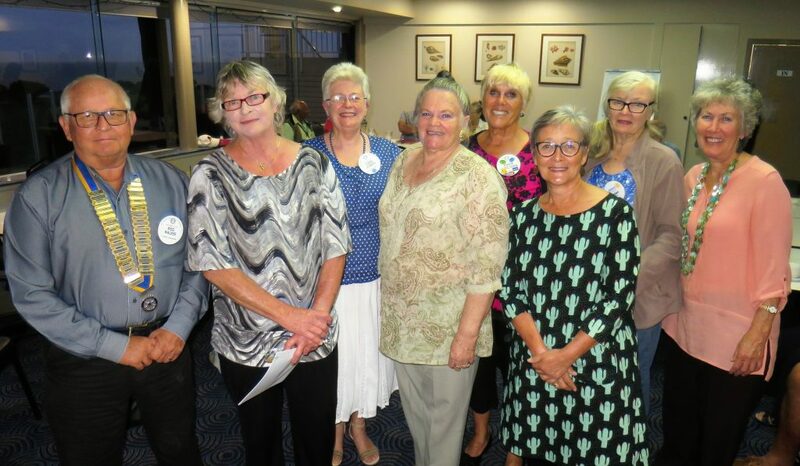 February 2019 – Narooma Rotary Club Inc.
Rotary President Rod Walker, Monty’s Volunteer Coordinator Di White, Chris O’Brien, Lana Swilks, Ang Ulrichsen, Helen Smith, Robyn Miller, Maureen Trees. I really enjoyed hearing about Monty’s Place last week and was particularly interested in how the simple act of providing a meal can add so much to people’s wellbeing. The way Monty’s provides access to other services was also impressive. I am sure we will continue to assist where we can. This week I am off to Canberra working and Laurelle will be in the Chair. I am working at the Royal Australian Mint where all our coins are made. No samples are given and security is intense. On a previous occasion I inadvertently tried to go out with a 20 cent coin rattling around in the bottom of my bag. Everything had to be emptied out to find the coin and I had to sign three forms detailing the age of the coin and other details. On Saturday, President Elect David and I are going to a Foundation Seminar in Ulladulla. This is a prerequisite for any District Grant. Perhaps we could assist Monty’s with a District Grant? Is there anyone prepared to follow this up? If you are give me a call to discuss. Don’t forget Clean Up Australia this Sunday morning (3rd March). Laurelle has the details. Our guest speaker is Narooma High Science Teacher Gayle Allison accompanied by several members of Narooma High’s robotics team, the Robo Rebels. Gayle is the Robo Rebels’ coach. The Robo Rebels started in 2015 and are still going strong with entries in competitions and running robotics workshops, all of which provides them with a fascinating insight into many aspects of science. Should be a fascinating evening. 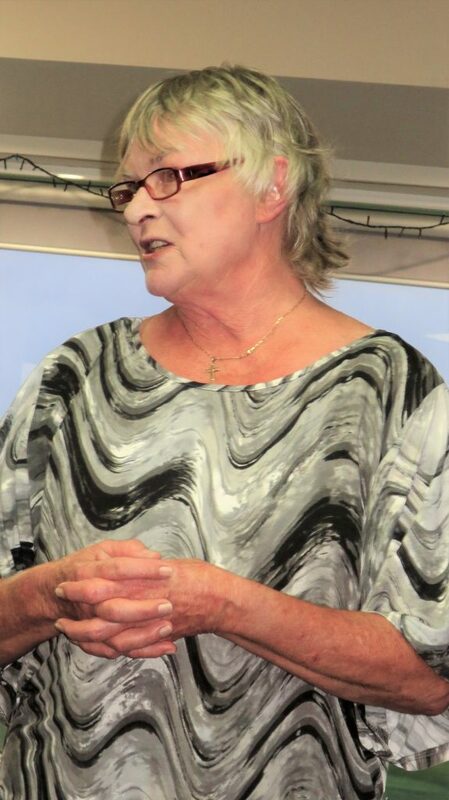 What an illuminating talk by Di White last week about Narooma’s Monty’s Place where Di is the Volunteer Coordinator. Three of our members, Robyn (Monty’s treasurer), Chris and Ange, are volunteers. Monty’s started in early 2013, largely modelled on the success of Ricky’s Place in Bega and opened for its first meal in the Uniting Church Hall in October 2013. Over the five years since then it’s really come together and gained a lot of support from across the community including donated equipment. SHASA (South coast Health and Sustainability Alliance), and MESA (Micro Energy Systems from Bodalla) for example, will donate the solar system; Smiley McGill and Dave Swilks built the deck which provides a popular open space where some prefer to be. 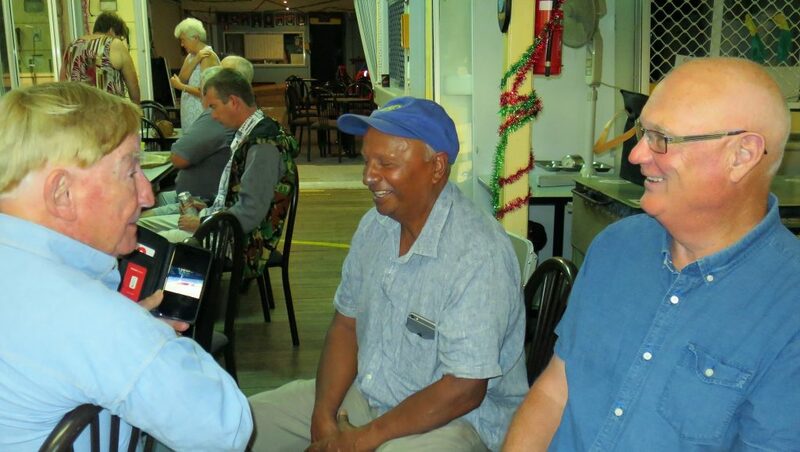 Each Wednesday, a two-course meal is served to Monty’s guests who cover a broad spectrum of people, from lonely older people, Koori elders, to those struggling to make ends meet, homeless people, some with mental health issues, and includes some young people particularly over summer. They average 70-80 meals a week, with 117 the most served to date. Monty’s also enables people to share a meal out with friends which they may not be able to afford to do otherwise. People often give a donation. A lot of produce and other goods are donated. They have a big project coming up to extend the kitchen storage area which will cost about $50,000. They will get 40%of funding from a Stronger Communities grant but will be looking to the community to raise the rest. Monty’s is a stand-alone organisation but for insurance purposes is under the umbrella of the Uniting Church. Monty’s has also helped the Uniting Parish, particularly through its Centre in the old manse next door. Interestingly. Cooma is looking at setting up something similar to Monty’s using Monty’s as a model. 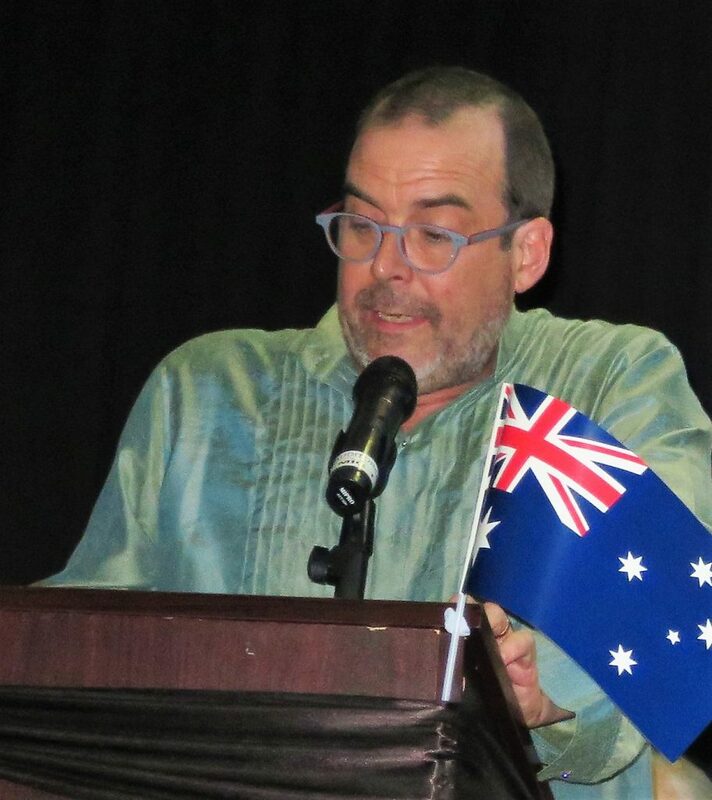 Mike Young proposed our international toast to the Rotary Club of Port Vila. Port Vila is the capital and largest city in Vanuatu, a bustling port town with hotels, restaurants and markets. Mike had lots of interesting details about the club and the area. Our Renewable Energy Expo instigator Frank Eden reported on a packed meeting he had attended at Tathra earlier that week which resolved that Tathra adopt the target of 100% Renewable Energy by 2030. A jubilant Frank said the meeting, chaired by CEFE President and Tathra resident Dr Matthew Nott, determined that this was an achievable target.Guest speakers included BVSC Mayor Kristie McBain, former Liberal leader Dr John Hewson, Professor Andrew Blakers from ANU’s Centre for Sustainable Energy, and Martin Poole CEO of Epuron, a company that has been instrumental in rolling out wind and solar farms across the country. For those who volunteered, please meet at Mill Bay at 9am when you can register and pick up bags and gloves etc from Laurelle who is our site supervisor. No person can take part unless they are officially registered. So far we have Laurelle, Ang, Mike, Rod, Gordon and Di as our volunteers, with Steve doing Lewis’ Island to the bridge. Laurelle is looking to extend our site from the bridge to the Bar Beach wetland because a recent ‘recie’ showed some other community-minded people had already done a good job along the boardwalk. Don’t forget hat, sunglasses (also offers eye protection from low branches etc), sunscreen and long sleeves, sturdy shoes and water. If you have one of those long ‘picker-upperers’. Please also bring. 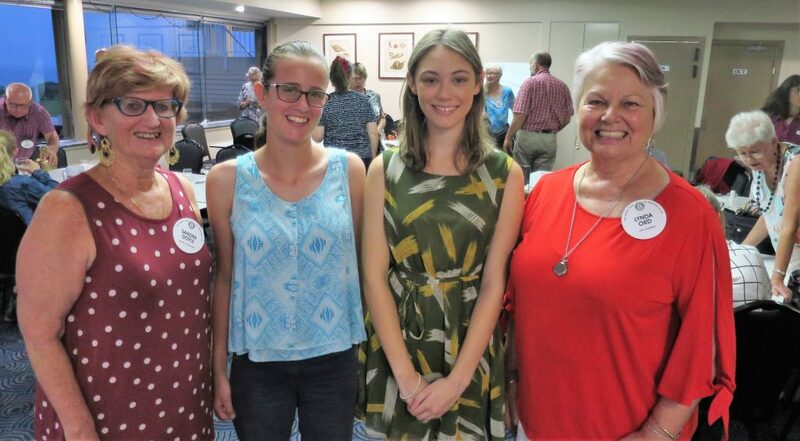 Moruya Rotarians recently heard from two local students who they presumably sponsored to the recent National Youth Science Forum (NYSF). Both students described the experience as life changing, not just in the contact with like-minded students, but also in helping them decide on their future careers. Bridget Lunn of Moruya High attended NYSF in Brisbane. It took her 24 hours travel by road to reach NYSF at Brisbane University. Her emphasis was on STEM subjects (science, technology, engineering and mathematics), and she particularly enjoyed visits to medical research laboratories. William Wall of St Peter’s College at Broulee attended the NYSF in Canberra, living in ANU student accommodation. 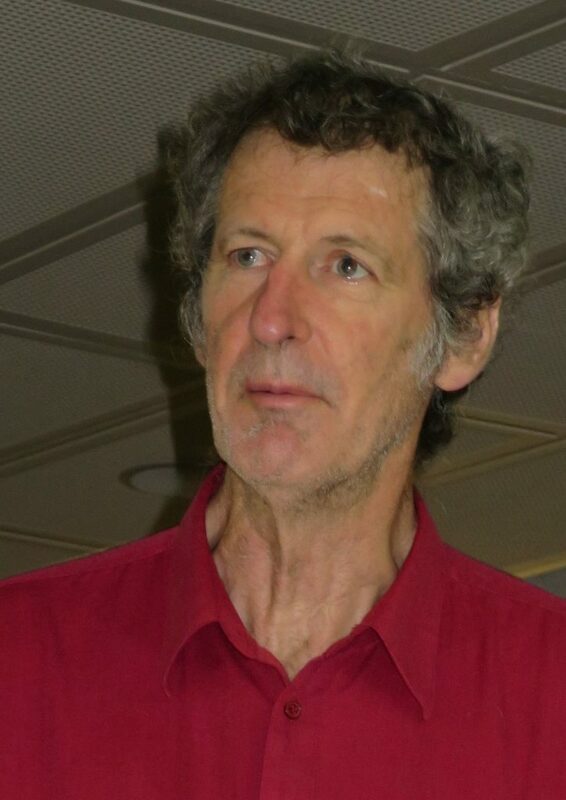 His interest in all things scientific was met by visits to the ANU’s computer complex, CSIRO and a chance to speak to scientists at the Hadron Collider at Switzerland’s CERN. The highlight of the week was the Joint Meeting at Moruya last Wednesday to hand over the proceeds of the Race Day fundraiser. Eight of us were there to see the Race Day Committee present Muddy Puddles with $20,000. See below for full details. 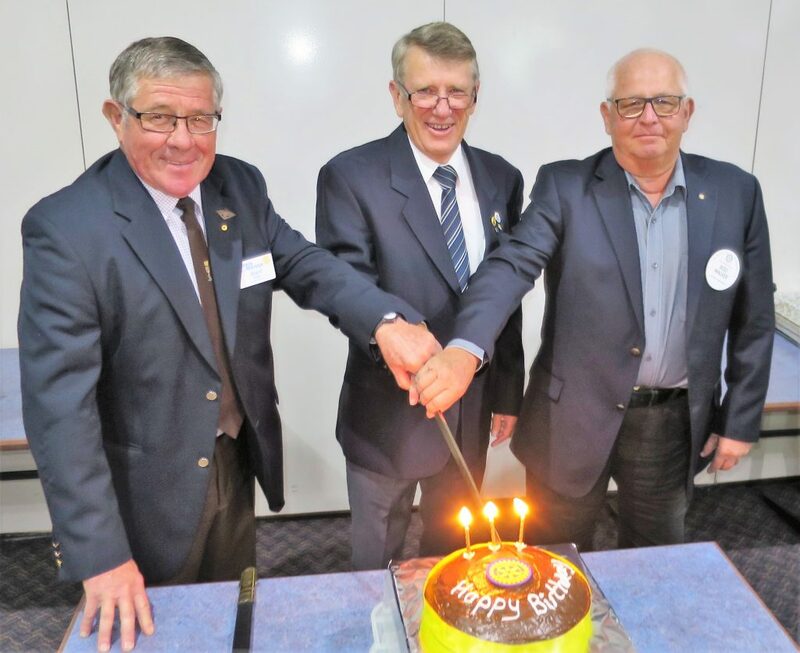 Cutting Rotary International’s cake celebrating 114 years at last week’s joint meeting at Moruya were Moruya Rotary President Ward Hack, Batemans Bay President Alan Russell and Narooma President Rod Walker. The ‘knife’ was a 150-year-old Royal Navy dirk presented to junior officers, purchased by Ward, a former Australian Naval officer. 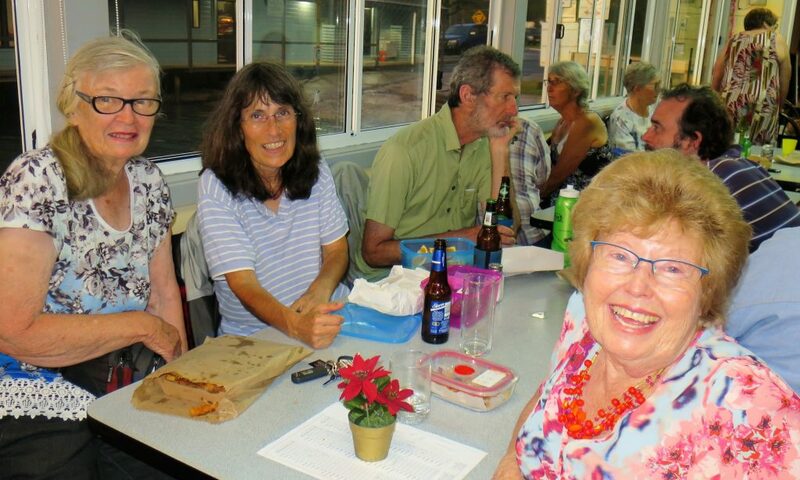 This Saturday 23 February marks Rotary’s 114th birthday, but we celebrated it a little prematurely at Moruya last week. It’s worth remembering our humble beginnings. Rotary was the world’s first service club and was founded on 23 February 1905 when lawyer Paul Harris and three friends met in a small office in downtown Chicago. These men wanted to rekindle the spirit of friendliness they had known in their home towns. Word of the club soon spread and others were invited to join. They named their new club “Rotary” to describe the practice of meeting in rotation at the members’ various places of business. Originally formed for fellowship, the first Rotary club quickly evolved to use the talents and resources of its members to serve the community. By the end of 1905, the Rotary Club of Chicago had 30 members. Three years later a second club was established in San Francisco, California, USA. The next year three more clubs were established on the west coast and a fourth in New York City. Within a few years other groups formed service clubs based on the Rotary model. It’s currently -6 deg C in Chicago. They were brave souls back then. I have two outstanding requests for assistance. If you can help, please let me know this week. I need someone to help me mark out NATA Oval for the market. All our usual markers are away. I also have received an application form for the Oyster Festival. Do we want to participate? Who would like to manage this if we do? Our first guest speaker for 2019 is Di White who will speak about Monty’s Place in Narooma. Di is the Volunteer Coordinator at Monty’s and acts as ‘Front of House’ in the dining room. She will talk about the value of volunteers and the growth of support networks around Monty’s Place. Please remember to let me know if you are bringing guests this week (Bob is away). A date for your diary. The annual battle for the Cinders trophy is on Wednesday 12 June in Moruya. Dust off those encyclopaedias. The trophy last year was awarded to both clubs in a draw. At the presentation of donations particularly from the Rotary Moruya Race Day were Moruya Jockey Club President Peter Atkinson, left, Rotary Race Day committee Chairman David Ashford and Muddy Puddles Finance Manager and a founding member of Muddy Puddles Anne Minato and Muddy Puddles CEO Cate McMath. Our three Eurobodalla Rotary Clubs and Moruya Jockey Club presented Muddy Puddles Inc with $20,000 last Wednesday, the proceeds from two race days, including the Rotary Christmas Race Day, and raffles. Moruya Jockey Club President Peter Atkinson said the Race Days show that Rotary and the Jockey Club can work together to deliver wonderful outcomes. “Our combined efforts have not only raised much needed funds for a very worthy cause, they have also raised awareness in our community of the wonderful work done by Muddy Puddles,” he said. Muddy Puddles is a not-for-profit organisation founded in 2014 by a group of concerned parents and community members who wanted more services locally for children with a disability or development delay. It provides therapy, development programmes and individual support to children and young people with a disability across the Eurobodalla Shire. 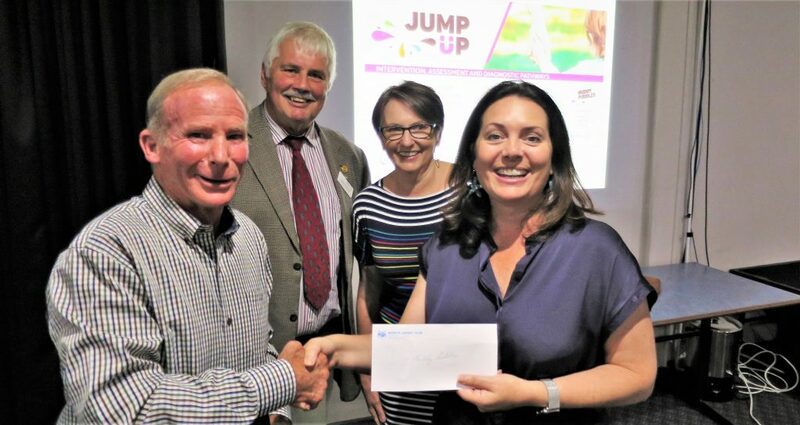 These funds will support Muddy Puddles’ Jump Up programme this year which provides young children not currently funded with immediate access to fully qualified therapists and educators, and supports families in accessing the services they need. Rotary Race Day Committee chairman David Ashford said this was the sixth Rotary Race Day. “In that time we have raised $119,000 that has also supported the Oncology Unit at Moruya Hospital, installed 12 defibrillators across the shire and made donations to the Shire’s four surf clubs.” David paid tribute to Moruya Jockey Club, to the ongoing enthusiasm and hard work of the Race Day committee, and to the willing volunteers from Rotary, their partners and friends, and from Muddy Puddles. He also thanked the raffle and race sponsors. “‘We cannot complete these events without everyone’s help and support,” he said. Cate also praised Member for Bega Andrew Constance, who had earlier addressed the meeting, for his ongoing support and in accessing funding for them to build their new Therapy Centre. Andrew spoke about the importance of early intervention and the huge impact on families of having someone with a disability. The Combined Districts (9700 and 9710) Drought Relief Committee, made up of members of both districts, has been meeting weekly to organise the distribution of donations from the combined RAWCS, National Farmers’ Federation and Channel 9 Today Drought Relief Appeal. Our DG Margaret Hassall is one of the committee’s project managers; PDG PDG Phil Armstrong of the RC Moruya is also on the committee. With Bega Valley Shire a Drought Declared Area, several committee members met recently with the presidents of the RC of Bega, Merimbula and Pambula, AG Bill de Jong as well as Mayor of Bega Valley Shire Kristy McBain. It was great to start back at Rotary last week with such a good vibe. It was our Youth Night and we were joined by four young people. One was Alicia Bate is our 2018 Rotary Scholar who begins at Charles Sturt University at Wagga Wagga this year, and another was Tahlia Arnold who also received funds from the Club to assist her with her first year at Wollongong Uni last year, as well as some for this year. We also received an email from this year’s recipient Cassidy Ker thanking us for her award. Andrew Thomas, Deputy Principal of Narooma High School, his daughter and another Narooma High student joined us. Hopefully we can build on this relationship with the school in the future to ensure that the young people of Narooma have the opportunity to participate in Rotary’s many Youth Programs. Now it’s time to look forward. I am more confident about the Club’s future now that we have President’s in place for the next two years. David McInnes for 2019-20 and Rolf Gimmel for 2020-21. David’s first official duty will be the Foundation Seminar which I will also attend on Saturday 2 March at Ulladulla. This will be quickly followed by PETS and the District Assembly at the end of March. Our next major activity is the February Market and John will circulate a roster this week. If you can help, please put your name on the roster. We will also need some assistance marking out NATA Oval . If you have some experience in this can you please contact me ASAP. The Busking Festival Committee had their first full meeting, chaired by our new coordinator John Rungen with Chris, Laurelle, Lynda, Lynn, Sandra and John Doyle, Heather Ferguson and Jenni French (nee Aston). Chris has already secured $8,000 in sponsorship. It’s good to see so many getting involved especially Club Friend Heather and Jenni. If you want to help, please contact John Rungen. The Committee meets again on Thursday 21st February 5.00pm at the Golf Club. Clean Up Australia Day is approaching. This year it will be on Sunday 3rd March in the morning. We will concentrate on our normal area between the Bridge and Apex Park. There has been some interest in participating but I need someone to register the site and liaise with the Shire contact. If you can help out let me know ASAP. Remember there is no meeting in Narooma this Thursday. Instead eight of us will join friends from Moruya and Bateman’s Bay Clubs in Moruya as well as Moruya Jockey Club to make a joint presentation from the Christmas races to our 2018 charity, Muddy Puddles. The meeting is expected to be chaired by Assistant Governor Alan Russell. The final sum will be announced on the night. Should be a big night; Moruya Club is expecting a possible 80 people.This is the sixth year we have been involved with Moruya Jockey Club. In that time, the combined efforts of the four organisations have raised $119,000; that money has supported the Moruya Oncology Unit, 12 defibrillators in our three towns, the four Surf Life Saving Clubs, and now Muddy Puddles. Great jubilation last Friday with the lease signing at the old Scouts’ Hall for a new home for the group. Note in the front row our very own delighted Peter Hartley. Laurelle represented the Club at last Friday’s lease signing for a new home for the Men’s Shed in front of over 60 people including NSW Transport Minister and Member for Bega Andrew Constance and Eurobodalla Mayor Liz Innes. The site is next to Narooma Scout Hall on land owned by the NSW Government adjacent to the corridor for the proposed Narooma bypass. The Bypass proposal dates back to the 1950s. NSW Roads and Maritime has leased the site to Council which has then sub-leased it to the Men’s Shed. The lease is for 15 years with a five-year option. Since 2012, Narooma Men’s Shed has leased temporary facilities in Glasshouse Rocks Road but that lease expires later this year. The Men’s Shed, with around 50 active members, persistently lobbied Council for many years to help them find a long term home. They intend building three sheds on the leased site and, through an agreement apparently yet to be finalised with the Scouting Association, use the old Scout Hall as their lunch room. Their idea is that the Men’s Shed will maintain the building but make it available for other uses. The group has already over $100,000 set aside for the project, with an anticipated extra $100,000 needed to complete it. They are now working towards DA approval. 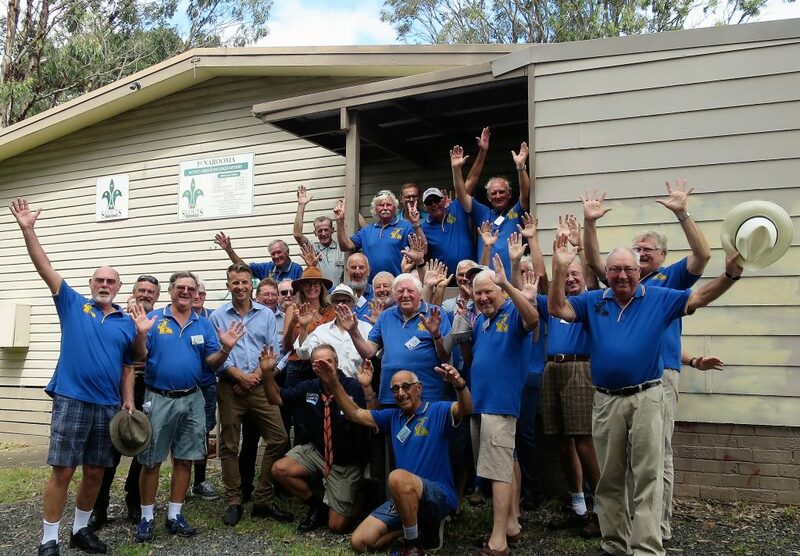 You might recall that the Scout Hall was Narooma Rotary’s first major project. It was built in 1959/1960 by Narooma Rotarians using recycled timber from renovations to Hyland’s Hotel (the bottom pub). That was in Bill Smyth Senior’s year as President. Over the years, the Club has also donated significant funds to assist local Scouts buy equipment. 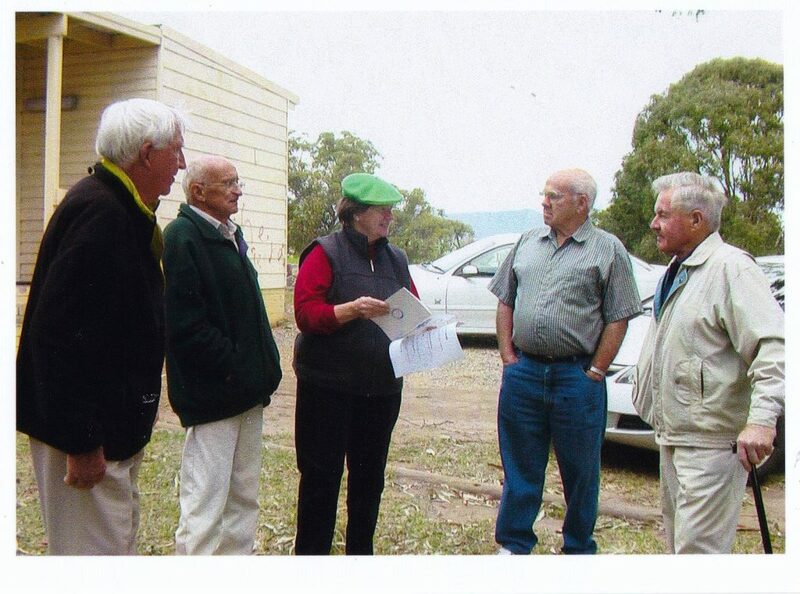 From our Archives: at the Scout Hall in 2008 for the filming of our Narooma Rotary Projects film for our 50th were those who helped build the Hall, Narooma Rotary Foundation members George Barker, left, and Neville Gough. Also taking part were former Narooma Rotarians Norm Hoyer and Ron Constable with film director Laurelle. Ideas are now being canvassed for an appropriate beneficiary of the proceeds of the 2019 Charity Race Day. The main criteria are that it can be readily identified as a joint Rotary and Jockey Club project, plus benefit Eurobodalla Shire as a whole. If you have an idea, please forward it to Rod and include a few words about why you are suggesting it. Melbourne will host the 2023 Rotary International Convention on 27-31 May 2023. It is expected to attract over 20,000 delegates making it the largest Conference held in Melbourne since the previous RI Convention in 1993. It will use the Rod Laver Arena and the Melbourne Convention & Exhibition Centre. 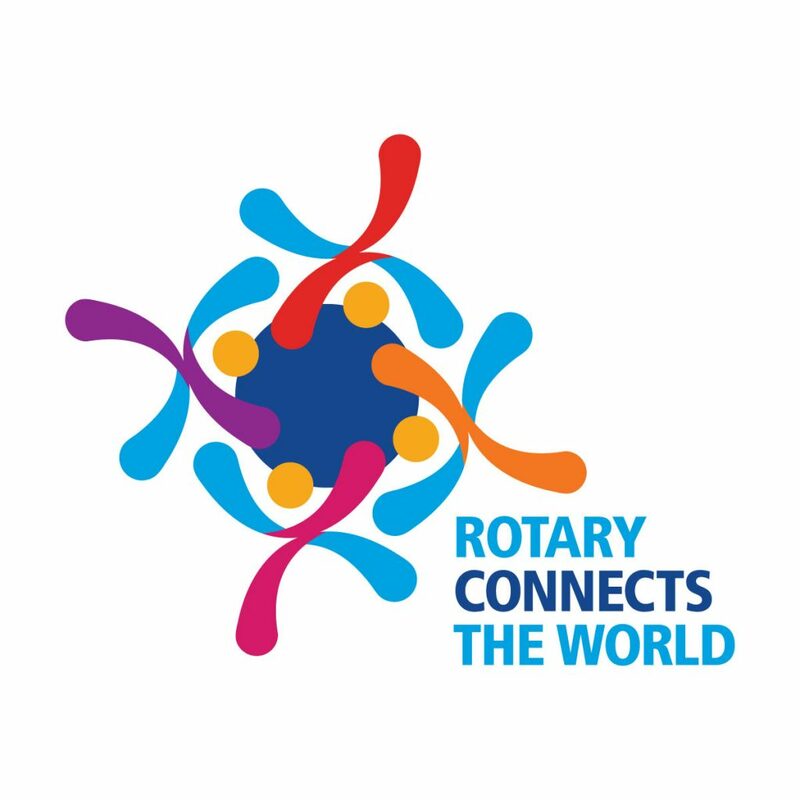 RI President-elect Mark Daniel Maloney’s theme for 2019-20 is Rotary Connects the World. He asks Rotarians to strengthen the many ways that Rotary Connects the World, building the connections that allow talented, thoughtful, and generous people to unite and take meaningful action through Rotary service. He said Rotary is built on connection. “When Paul Harris came to Chicago as a young lawyer, he formed Rotary for one compelling reason: to help him connect to others in a new city. More than a century later, we have at our disposal countless ways to form friendships and networks, most of which Paul Harris never dreamed. Great news that David McInnes has put up his hand to be President of Narooma Rotary Club 2019-2020. He will be a wonderful president and will have the full support of members. 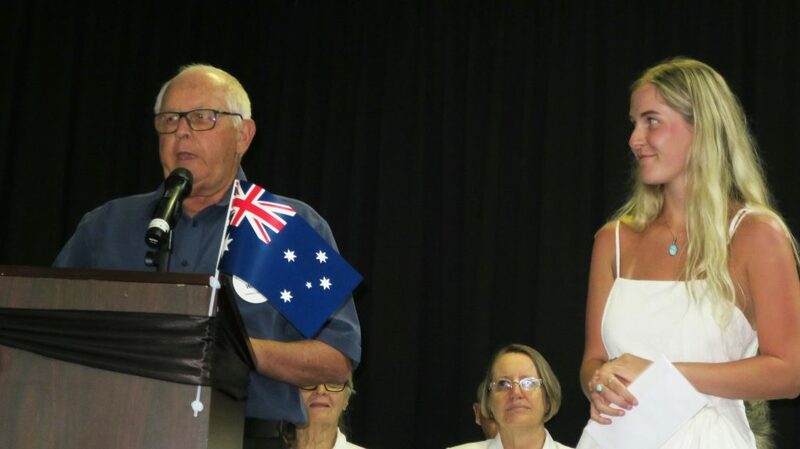 David recently did a wonderful job as MC for Narooma’s Australia Day ceremony on the 25th at Narooma Golf Club. David has also joined Narooma’s Australia Day Committee. It must be the first time for many years that our Club not only has an incoming president but also a President Elect for 2020-2021 (Rolf Gimmel) at this early stage. The Club’s future is looking bright. This week is our first night back after the break and of course our Youth Night. Joining us will be our 2018 Narooma Rotary Tertiary Scholarship winner Alicia Bate who had a gap year last year including working in the United States. It will be interesting to hear about her gap year and her plans for studying for a Bachelor of Animal Science at Charles Sturt University with hopes to transfer to a Bachelor of Veterinary Science/Veterinary Biology. Also joining us will be Tahlia Arnold who received a one-off scholarship for 2018 of $3,000. Last year Tahlia completed her first year studying Psychology at the University of Wollongong with outstanding results. The Board late last year decided to give Tahlia an additional $1,000 scholarship for 2019. It was great to catch up with many members at the Fishing Club and enjoy fish and chips from the newly opened Inlet. Here are a few photos. President Rod presented Cassidy Kerr with the 2019 Narooma Rotary Club Tertiary Scholarship at Narooma’s recent Australia Day Awards. Cassidy will do a double degree in Law and Psychology at the University of Wollongong. Unfortunately Cassidy won’t be able to join us for our youth night this week because she has already headed to Wollongong to get sorted ready for the start of university. Interestingly Cassidy is the 29th student from Narooma High who Rotary has helped pursue their studies and achieve their dreams. That assistance now totals over $248,000. The scholarship is awarded from a trust fund established from a bequest by the late Alexander Birch which is now being topped up from other fundraising activities, including the recent Duck Race. This year we have four students receiving scholarships – Melanie Miller (2016), Sabine Kildea (2017), Alicia Bate (2018) and now Cassidy (2019). What a great event thanks to Charmaine White’s great organisation and our wonderful team of willing helpers. Narooma Bridge was packed with onlookers as the 1,000 ducks leapt off the bridge for the start our great Rotary Australia Day Duck Race, watched by a newly arrived Big Duck from China. 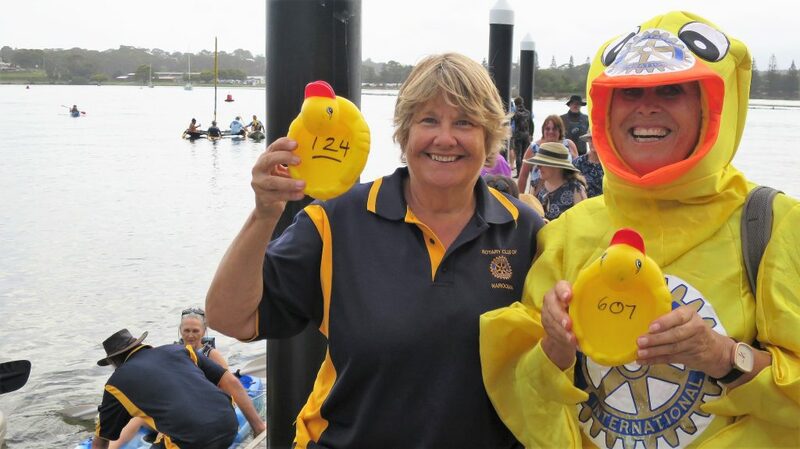 The winning duck 124 was held by Merilyn Blakeman of Leeton who won $1,000. The last duck was 607 held by Michael Madden of Dubbo who won $100. Duck race coordinator Charmaine and Chief Duck Ange hold the winning ducks. Charmaine and President Rod thanked everyone who made the Duck Race such a fun event – supporters who bought tickets, the hundreds of spectators, duck droppers and duck collectors who came in a flotilla of various craft and included Rotary friends and Eurobodalla paddlers, as well as lifesavers from Narooma Surf Life Saving Club. Proceeds this year will go towards the Club’s Tertiary Scholarship fund. The Club will also make donations to Narooma Surf Club in appreciation of their assistance and to Bermagui CRABS (Cancer Research Advocate Bikers) who lend us the ducks. Clean Up Australia Day(s) are fast approaching over the weekend of 2-3 MARCH. Normally our Club cleans from Narooma Bridge to the Apex Park Boat Ramp. Is anyone willing to lend a hand ? We will have to register. Eurobodalla’s Clean Up Project Officer Maree Cadman says Council supports the Clean Up Australia Day program by assisting with campaign promotion, group coordination, and the pickup and disposal of rubbish. It is not a Council run event; Clean Up Australia provides Public Liability cover for volunteers officially registered with Clean Up Australia. This great programme will be held on Monday 1st and Tuesday 2nd April at Moruya Jockey Club. It targets pre-learner drivers from Eurobodalla Shire’s five high-schools (so Year 11 students) and is run by Batemans Bay Rotary in conjunction with Moruya and Narooma Clubs. We normally provide a few members who help on the day Narooma High students attend as well as pay for the bus for Narooma High students. At this stage RYDA coordinator Neil Simpson is not sure which day will involve Narooma High. Can anyone help? RYDA is an opportunity for students to learn and talk about how they will function as a driver or a passenger. The RYDA programme is written and resourced by Road Safety Education (RSE) Ltd (www.rse.org.au) and is presented to students from 600 schools across Australia. The theme of the day is ‘My Life, My Choices’ and covers a broad range of topics including hazard perception, fatigue, stopping distances, vehicle safety and the opportunity to listen to and speak with a crash survivor. RYDA is a significant youth project for our clubs and particularly involves Batemans Bay and Moruya members in organising the days and in catering, as well as Council, Moruya Jockey Club and Coastal Auto Group. You have no doubt caught up with the fact that the Griffiths of the Kinema both won the Order of Australia (OAM) in the recent national Australia Day awards (see last week’s Independent and this week’s Narooma News. Rotary’s own Fred Fawkes also received an Order of Australia General Division for services to the community of Canberra. We have all seen Fred in action in ShelterBox and RAWCS but when you read the full citation, these are only a fraction of his community involvements, now and over the years since he retired as a Superintendent in the Federal Police Force. Heartiest congratulations Fred!